If it seems like the Toronto Blue Jays are hacking away at pitches more than any other team in the majors, it’s because they are. Check out this data courtesy of Fangraphs, which ranks the Blue Jays as one of the top teams who whiff at pitches whenever or wherever they can. The fact that the Blue Jays are one of the most swing-happy teams in the majors isn’t what freaks me out. What is troubling is that their contact rate is one of the lowest in baseball. It’s one thing if the Jays lineup was comprised of nine Vladimir Guerrero’s. Out of all the hitters in baseball, Vladdy swings at the most pitches off the plate. However, he makes contact with those pitches 71.4 percent of the time, often for bloop singles which fielders have a tough time reading. And just in case you were wondering, Alex Gonzalez ranked third in MLB for swinging at pitches outside the strike zone at 43.8 percent of the time. I had a sneaking suspicion that Gonzalez has been swinging all over the place, and these stats confirm his insatiable hunger for pitches off the plate. Hat tip to Bredan Wiese (@bwiese16) for the heads up and Fangraphs for all the statistics. Where Does Vlad Guerrero Fit In? A-Gonz has always had the rap of being a hacker with some power, so his early season line hasn't surprised me that much. Just a couple more balls have gone out this year as opposed to past ones. 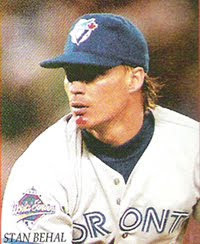 Steve, I never realized how much of a hacker Gonzalez was until he came over to the Jays. It seems like he's always taking a swing at the first pitch. Mattt, last night was a good game to be swinging away. That's the upside of having so many hitters with HOUR potential.